This sort of millet, the red proso millet or red panicum (Panicum miliaceum), has quite big grains. They are shiny red and therefore unmistakable. For most small pet birds is fairly hard to remove the hulls. Many common seed mixtures contain red panicum. It can also be used for preparing sprouted seeds. My budgies prefer to eat sprouted red panicum because it's softer than unsprouted red panicum and the hulls can be removed much more easily. 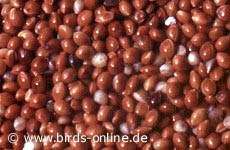 Attention: If you own relatively young small pet birds you should offer them seed mixtures that only contain small amounts of red panicum. For young and untrained birds it is quite hard to remove the hulls from these grains and therefore it makes feeding difficult.